Cheese Slicers of very high quality. Now we can also offer a cheese silcer in Nylon PA6 that cuts perfect slices of hard and soft/fat cheese. 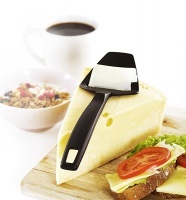 Cheese Slicer in nylon PA6, black. Cuts perfect slilces of hard and soft/fat cheese. Cheese slicer with bended outer edges to reduce friction. Made of stainless steel, handle in PP. Cheese slicer for soft cheese with short blade for minimal friction. Made of stainless steel, handle in PP. Cheese grater for shredding cheese. Made of stainless steel, handle in PP. Osti Cheese slicer with double wire, cuts thick or thin slices of cheese which can be placed on sandwiches by means of the little fork at the top of the slicer. Spare wires are available as accessories. Made of stainless steel and PP.